When my mom and me went to Harajuku the other day, we took some Purikura, just for fun, it is a cute little memory to keep in your wallet. 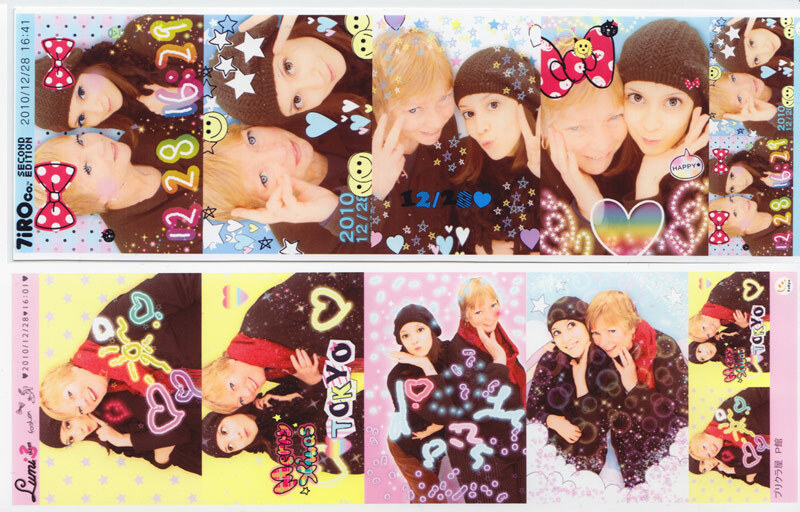 If you don’t feel like you are looking particularly good on any given day, take some Purikura! It is a photo booth that will automagically make your skin perfect, automatically apply makeup, it will make your eyes larger, the colors in your eyes clearer and your lashes longer. Inside the booth, it is shown on a screen how to pose for the different shots you have selected. Once the shots are done (this goes super-fast), you can doodle on them on a screen at the back of the photo booth, apply text and pictures and whatever you like, before the machine prints out your pictures, pretty much like a regular photo booth. Purikura actually comes from the word Purinto Kurabu (プリント倶楽部), which comes from the English words Print Club. (It seems like people have started to make web pages to do this online, after a quick Google search I found this and this, so now you can try it at home as well. Ha.) /end infomercial.